In 1865, an English author and scholar with an abiding interest in mathematics and logic published a tale originally told for the amusement of a friend’s young daughter, Alice. The resulting novel, Alice’s Adventures in Wonderland, was largely ignored at first, but then rapidly rose to fame, with such prominent admirers as Queen Victoria and Oscar Wilde; its nonsensical language and endearing characters have made it beloved of generations of children and adults alike, and the escapades of young Alice have inspired writers the world over. Alice’s Adventures in Wonderland has never gone out of print. With such universal appeal, it’s no wonder that the quasi-logical tricks and banter of Wonderland have cast a long shadow on modern fantasy. Echoes of the Queen, the Cat, and others can be found in tales old and new, and the idea of falling into a strange, bewildering world is one of the favorite tropes used by authors of the fantastic. 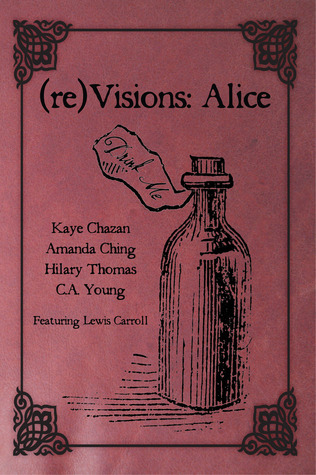 The (re)Visions series seeks to bring classic works of speculative fiction back into the modern consciousness, examining how tendrils of the fantastic spiral through all that we think and do, even decades after a work was penned. First, read Lewis Carroll’s (extremely) original work; then, let your mind wander through the gardens and passages of Wonderland, guided by four very different modern authors. And don’t forget your flamingo. Before I get to the main review I just have to say this, because to be honest I can’t hold it in. This book was brillant! The stories are so original and more then once did I find myself smiling like the Cheshire himself. Okay okay, now hopefully I can do this without gushing my love and adoration all over.Not likely. The first story, What Aelister Found Here by Kaye Chazan, is more cryptic then the other three stories and really calls for you to think about the connections and what may be happening more. It’s not hard to understand really it’s just hard to see where it’s going, which for a short story related to the world Wonderland I think that’s perfect. I enjoyed the main character Aelister, and the way he thinks as the book progresses. The Duke was also really cool. I enjoyed how as the story progresses the way things are explained are slowly changed, and what Aelister sees and thinks changes too. I don’t know if this was a good story to start the book off on, i personally found it really strange and it didn’t grip me right away. So maybe if this were the second or third story it would have been better. House of Cards by Amanda Ching, is the second story and not quite as cryptic as the first. Only enough so that it becomes more of a slightly twisted mystery. At first it is much like Aelister in the fact that while you see the connection you can’t quite grasp exactly where it is going. Part of this has to do with the way it is told, and that should taking into account. It’s written in several point of views which switch but it also has a non-liner progression. Basically that means that it doesn’t flow from past to present but rather picks up in several different places. It’s not as confusing as it sounds, but it is confusing enough that it delays you drawing a direct conclusion. About half way through I understood basically what was going to happen with the main character Mary Ann, and thought the idea was genius. I don’t want to give anything away because that might ruin some of it for you so I can’t say too much, but this story has a really creative ‘introduction’ to Alice. This is the most similar to the actual story. Knave by Hilary Thomas, is a really clever piece of work. It’s Wonderland, but it’s Noir style. So not only is it dark and slightly convoluted, it’s also gritty and more realistic. I don’t’ honestly know where I stand with Noir, because I have so many bad experiences with it in written and movie form but I have enough a few enough that it doesn’t make me dislike the genre. However I know exactly where I stand with this one, I love it. I think I smiled the whole way through this one because I thought the connections to Carroll’s Wonderland were genius. This one is narrated by the Knave himself as he works his way through trying to figure out just who this mysterious girl is that’s disrupting the on goings of Wonderland. And lastly, but certainly not least as this one was probably my favorite, is The World in A Thimble by C.A. Young. This one focuses on the main character Toby who much like Alice is abruptly introduced to Wonderland. His journey while similar is also drastically different, and the story itself presents more of a moral then the original does. This one is more of a symbolic of what can happen when you loose yourself to what Wonderland ‘has’ to be, instead of it being what you personally want it be. Of course I may be off base on that but that’s how I felt toward the end. Just because something is given to you a certain way doesn’t mean you have to accept it that way. I loved the creative use of the characters and the world of Wonderland, and more then that I loved the symbolism. I’m not sure if it’s because of the reading order but as I read I liked the next story more then the previous. It just kept getting better for me. I definitely recommend that older fans of Alice in Wonderland find this book when it comes out, it’s worth the time and it’s such a fun read. You are bound to like at least one of the stories. I’d hesitate to let a younger reading, say under 16, read this though just because of a few moments of sexual activity (tasteful), some violence, and a large amount of cursing in Hilary Thomas’ story. These are not kid’s stories but I definitly that makes them far more delightful. This entry was posted in Book Reviews (2011) and tagged 5 stars, fantasy, review. Bookmark the permalink.